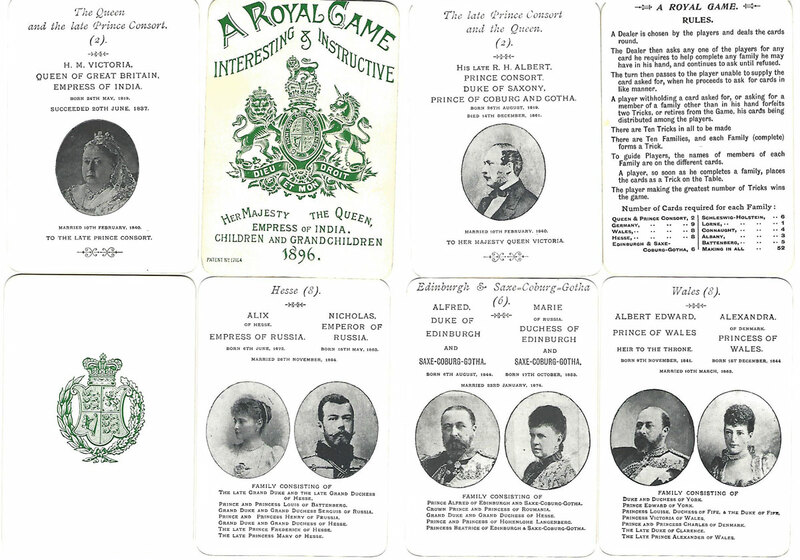 An ‘interesting and instructive’ Victorian Happy Families type card game showing Queen Victoria’s extended family connections, 1896. The cards show monochrome photographs of Queen Victoria’s children and grandchildren divided into ten sets to be collected. Many cards show more than one picture and all of them are either a child, grandchild or great grandchild related to Victoria, or those they married. Amazing the size of her family, by the time she died she had a foot in just about every royal house in Europe! Above: “A Royal Game”, 1896. 52 cards + rules in box. Images courtesy Nick Thomas.